I joined this campaign thru Bzzagent. This was an enlightening BzzCampaign! Have you ever heard of OXO? Check out OXO on Facebook and "Like" it. Follow OXO on Twitter to stay up to date with the latest from Oxo. I was able to review a set of OXO Candela Glow rechargeable lights. I received a set of 2. 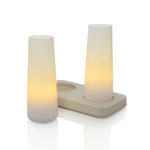 Light the night with OXO Candela Glow rechargeable lights. Our warm, ambient LED lights can be left unattended and won’t blow out in the wind. With 8 hours of run time, these versatile lights create ambiance on the dinner table or bedside, while entertaining or reading alone. Portable and cordless, they are suitable for many uses and occasions. The long-lasting Glow rechargeable LED lights are brighter, safer, cleaner, more durable and easier to use than candles. Pack includes 2 LED lights with rechargeable batteries and charging base. This has been one of my favorite Bzzcampaigns! I like that they came with a charger base and they run for 8 hours with a full charge! I have used them to read at bed time and provide light when i am on my computer at night and don't want to wake the kiddos. The kiddos used them for a camp out in the back yard. We also use them as night lights for the hallway at night! These are neat! You can use them for so many different things. disclosure: I received a 2 pack OXO Candela Glow rechargeable lights from Bzzagent in exchange for my review. Those seem really good. We like to eat outside a lot, and I could put one in the hurricane container like a candle that doesn't get blown out by the wind. Thanks for a great review! Support My Favorite Charity for FREE!